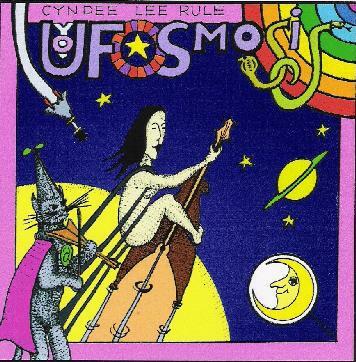 Cyndee Lee Rule - "UFOsmosis"
Drawing from a diverse palette of global influences - including Hawkwind, Gong, Afro-Celt Sound System and Trans-Siberian Orchestra - Cyndee Lee Rule's debut CD UFOsmosis deftly, and sometimes arbitrarily, fuses elements of space rock, new age, neo-progressive rock, world music and ambient dance into an occasionally bewildering and often breath-taking panorama of first realizations. Fiercely eclectic, UFOsmosis is intent on dissolving sonic boundaries while at the same time resolving the inherent contradictions that seemingly distinguish musical genres. Rule's axe du jour is electric violin, but on many of the eleven songs on UFOsmosis she wisely sheds the instrument's association with art music and instead shreds like some demented banshee on psilocybin. Strangely guitar-like, often shrieking and soaring, but with a brutal elegance rarely associated with the instrument, Rule's 5-string Viper rips through the electronically processed soundscapes of pieces like "Seven Cities of Gold" "What on Earth?" with a vengeance that reminds one of Didier Lockwood's demolition of the instrument with the early incarnation of Magma or Jean-Luc Ponty's similar chain saw pyrotechnics with the Mahavishnu Orchestra. "Congress Reel," for instance, features plenty of hot licks that ascend and spiral like floating cobras in a dervish dream of serpentine Persian scales, while "The Inner Light," a curious cover of a late Beatles curio, roils with the neo-futurist groove of Massive Attack crossbred with the wailing spiritual surrender of a Shankar raga. On the other hand, Rule's dynamic cover of Hawkwind's "Assassins of Allah" strips away the song's original heavy rock bias and imparts to it a sleeker, more frenetic edge, as if a troupe of traveling Bedouins had fired up the hookah, the drum machines and the synthesizers, plugged the violin into a Marshall stack and rocked the djinn down in a Tangier garage. "Telekinetigram" continues the calculated merger of 1st world technology with 3rd world sensibilities. Here Rule allows her violin to take wings and dive bomb through the starry ether, while buoyed to earth by a super-gooey LFO-modulated synth arpeggio. Both manic and mannered, with a fiery finesse that embraces a studied classicism without sacrificing emotional intensity, UFOsmosis is a cathartic hour under the headphones. For more information you can visit the Cyndee Lee Rule web site at: http://www.soundclick.com/cyndeeleerule.